Awesome photographs of tigers by a hunter-turned-conservationist. In the true Rana family tradition, Nanda Rana had always been keen on hunting and wanted to shoot a tiger. In India, on a hunt organised by family, he finally had the chance to make that dream come true. On the fateful night, Nanda was armed with a powerful gun when a majestic tigress stepped out of the dark undergrowth into the moonlit clearing. "It looked so easy. My companions urged me to shoot but all I could see was the tigress's power and grace. 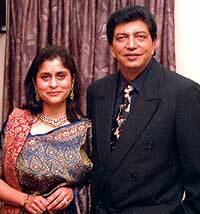 It was the most beautiful sight I had ever seen and I just could not destroy that beauty," recalls Nanda. And so, this great-grandson of Chandra Shumshere, dropped his gun and picked up a camera instead. Thirteen years after that incident Nanda Rana is an internationally acknowledged expert on tiger behaviour, considered by some to be among the best. His commitment to the cats intensified when, over a 10-year period, he tracked a family of tigers for nine months of the year: the result is a rare and stupendously beautiful documentation of tiger behaviour. 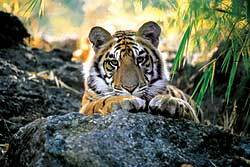 In December 1997, his work as a wildlife consultant with National Geographic resulted in a cover story on tigers, a book and a documentary film for National Geographic Television. It was followed by Partridge Films producing two full length natural history films based on the tigers of Bandhavgarh National Park in India, where these pictures were taken. The films, Sita's Story and A Tiger's Tale together took four-and-a-half years to make. Nanda followed Sita's saga from the time she was a three-month cub into adulthood, and when she bore six litters herself, and those cubs grew up and bore their own litters. 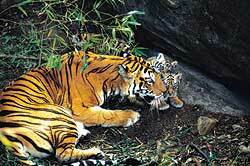 Nanda Rana's films and photographs showed for the first time, male tigers interacting with their cubs. A series of photographs show Sita's mate interacting very affectionately with a male cub: he nuzzles his young and even shares portions of the kill with him. This was in complete contrast to the belief that adult males feel threatened by male offspring and will kill them if they get the opportunity to do so. Nanda continues to document Sita's legacy, immortalising five generations of tigers on film. When his pursuit of the tiger was redirected towards conservation, he tracked one pride for over two decades. 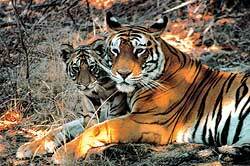 Nanda Rana is now worried about the dwindling numbers of Royal Bengal Tigers in the subcontinent. The population is down to approximately 3,000 to 4,000 from the estimated 40,000 at the beginning of the 20th century. Conservation has helped protect what is left, and the world population today stands at 6,000 to 7,000, of which there are an estimated 200 to 300 in Nepal. But habitat loss, diminishing prey and poaching continue to threaten the survival of these magnificent animals. Although he itches to leave the urban jungle and return to photographing and following tigers, Nanda does not take his role as a conservationist lightly. He wants to increase awareness especially among the young and has presented slide shows and awareness programs that focus on tiger conservation around the world. 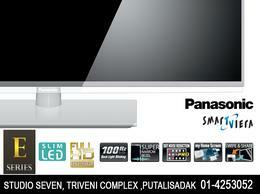 Recently Nanda Rana's photographs were shown at a fundraiser in Kathmandu for Wildlife Conservation Nepal. 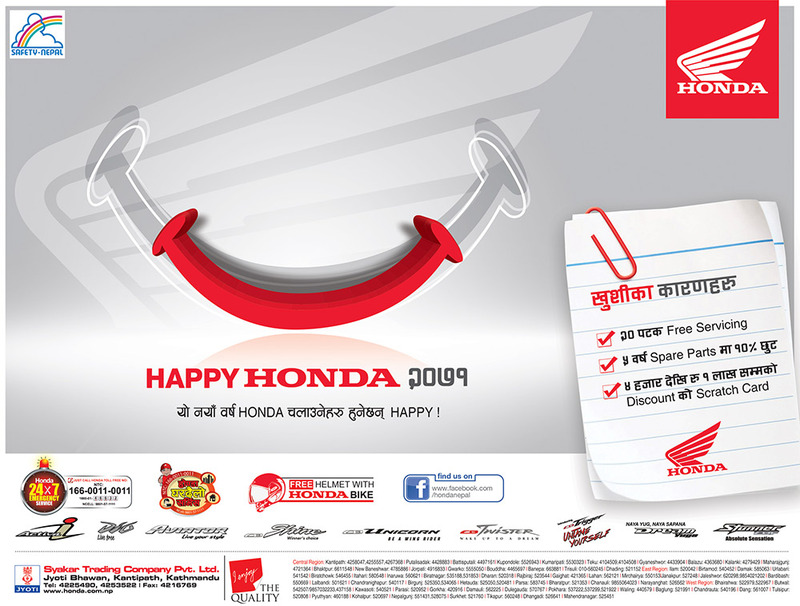 These will be exhibited for the public at the Nepal Tourism Board later this month. Rare photographs of Sita's family will be on display. "Conservation is a purely management issue," says Nanda Rana, who now lives in Kathmandu with his wife, Latika (see box.) 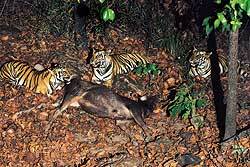 Being the apex species at the top of the food chain, protecting the tiger also means that the entire habitat is protected. Nanda is convinced from his experience with his resort at Bandhavgarh that the people dependent on the forest must benefit, or at the very least, their livelihood must not be hampered in order for conservation efforts to succeed. Says Nanda, "Manage the forest and its resources like a business, and we can still safeguard the future of the tiger." Sita had three cubs in her sixth litter. Here the male cub rubs against her in a display of affection. Cubs tend to stay with the mother for upto 30 months and the mother will not usually mate till the cubs become independent and disperse. 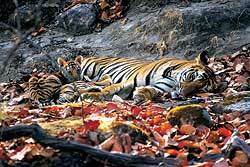 The tigress, Bacchi, suckling her 6-week-old cubs outside a large den. Bachhi is the daughter of the tigress Sita from her 4th litter. The cubs in the photograph are the third generation of tigers in this series of photographs. This is a photograph of a year-old male tiger cub in the early morning. The cub was sitting on a rock and looking at approaching elephants. At this age cubs spend a large part of the daylight hours sleeping and at play and it is only towards dusk that the mother will take them with her to teach them to hunt. These are the same cubs in 2. At the time the photograph was taken the mother had gone off to hunt, leaving the cubs at this place. By this age the cubs have learnt to kill small animals but still depend on the mother for regular food supply. This was the first time the three young males were seen to make a large kill on their own. The brothers had just begun to separate from the mother and were still living together within her territory. Sita, with her three three-week-old cubs. Tigresses keep their cubs in caves and niches in rocks when they are newly born, but will move if they sense a threat to the cubs. Sita moved this litter seven times in three months. 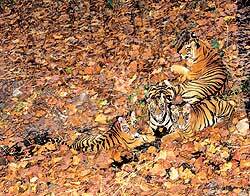 Tigress with her three cubs resting in a glade of sal leaves, revealing the amazing camouflage of the tiger. The tigers are in their winter coats when their colours are richer and thicker. When the National Geographic Channel crowned Latika Nath Rana 'The Tiger Princess' on its Truth Files program broadcast last month, the producers knew they had a winner. Seeking out women and men who identify, conserve and communicate the importance of the earth's geo-diversity, they found an exemplary candidate in Latika. 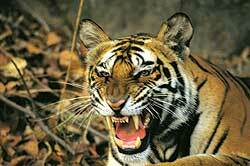 The Geographic film documents Latika's personal quest to save the tiger. Even at age seven, she knew what she wanted to do. But it was a long journey fraught with obstacles. Later she would say, "It was the sheer majesty of the animal that attracted me. I was amazed by the supreme control of the animal, its nature to lead its own existence. It was a thrill seeing something so beautiful and untamed left alone in the wild." Much of Latika's research, beginning at the age of 24 with a scholarship from the Indian Wildlife Institute and the six years it took her to complete her PhD on tigers at Oxford, was done at the Bandhavgarh National Park in central India. 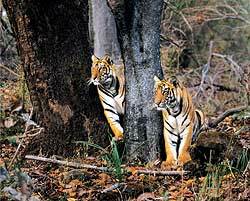 And it was there that she met her husband, Nanda Rana who was managing the Bandhavgarh Jungle Camp and photographing tigers to study their behaviour. "I was a wildlife scientist and Nanda a photographer, and we complemented each other well to understand tiger behavior previously unknown to us," Latika recalls.